CONTINUE TO SHOW & OPEN HOUSE OCT. 7TH! 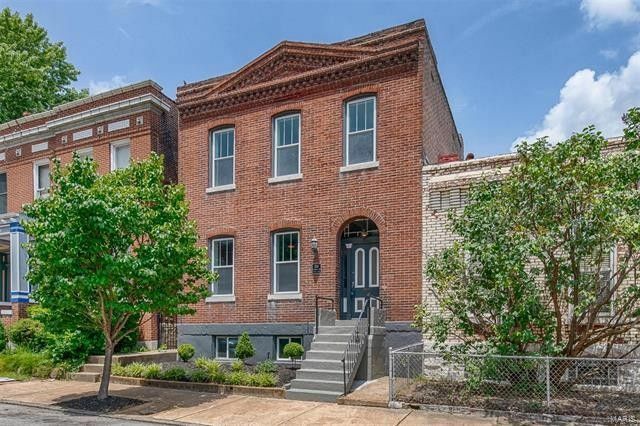 This elegantly remodeled 3-bedroom/3-bath brick home is centrally located in the heart of highly desirable, historic BENTON PARK neighborhood, and boasts tons of historic charm and modern features over 2,150 sf of living space! Enjoy city living in an active, walkable community with historic architecture and an abundance of amazing restaurants, markets, shops and cafes! This gem is located just steps away from four parks with year-round events, trendy Cherokee Street, Gus' Pretzels, Anheuser Busch Brewery, Mud House, with quick access to I-55, downtown, hospitals, major highways and more! The sophisticated 1st floor interior updates include new pre-engineered hardwood floors, exposed brick walls, restored original staircase and trimwork, contemporary light fixtures and 9-foot ceilings. The spacious kitchen is furnished with new granite countertops, mosaic backsplash, recently refinished white shaker-style cabinets, energy-star appliances, large pantry and a center island, perfect for entertaining! The newly carpeted 2nd floor features two bright guest bedrooms, convenient 2nd floor laundry and a MASTER SUITE with a beautifully updated private master bath with double sinks and large glass shower. Additional perks include zoned heating and cooling and low-E, insulated vinyl windows. On the exterior, the fully fenced yard offers a cozy brick patio for your summer BBQ’s and plenty of lush green space with attractive fresh landscaping. The home offers peace of mind with a HOME WARRANTY PLAN, 400 amp electrical panel, updated plumbing supply lines, PVC waste stacks and main water supply line from the street to the interior, partially new sewer line, new vinyl siding and more! Directions: From I-55, take Exit 206C to Arsenal St going west, turn left onto Lemp Ave, then right onto Withnell Ave. From Jefferson Ave, turn east onto Utah St, left onto Illinois Ave, then left onto Withnell Ave. One-way street - house will be on your right.